Stomahesive Paste by ConvaTec is a protective, hydrocolloid skin barrier paste that can be conveniently used as a filler for uneven skin surfaces. This stomahesive paste can help increase ostomy system wear-time while simultaneously protecting the skin from irritation, redness or inflammation. 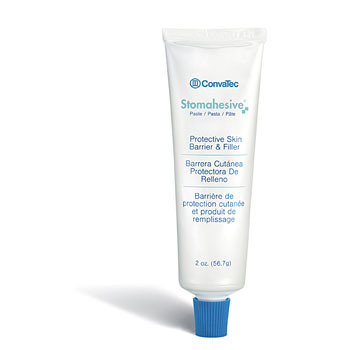 Stomahesive Paste by ConvaTec is designed with non-sensitizing ingredients to create an irritation-free skin barrier paste that can be used by a broad range of people. By providing an optimum seal that is both sturdy and comfortable, this stomahesive paste is a great option for any person seeking a non-irritating, easy-to-use protective paste. You might also be interested in similar skin barrier products that we offer, such as Cavilon No Sting Barrier Film. Can be used as a filler in uneven skin surfaces. Helps increase ostomy system wear-time while protecting skin. The stoma adhesive you can trust. This works well with all brands of stoma wafers. It also sets pretty fast so it's easier to use than the other brand which takes more than 30 minutes to set. It is also very affordable if you order it through Vitality Medical. I just love how this product works. Combine it with excellent customer service, I know I couldn't ask for more. Stomahesive Paste Is The Best! I am a health professional and I have witnessed how safe and strong ConvaTec Stomahesive Paste is as an adhesive for medical appliance. It is best used following surgery. It effectively fills the uneven surfaces of the skin which helps to protect skin and increase the wear – time of ostomy. That’s why I strongly recommend this product!